Last month I attended Elements Gathering for the second year. 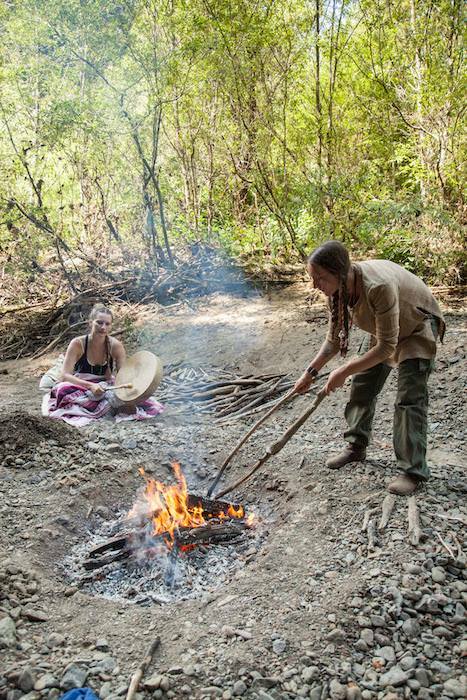 This gathering, like many others, focuses on sharing ancestral skills and creating community for 7 days out in nature. A variety of classes are offered ranging in topics from bladesmithing and hide tanning, to acro-yoga and sound healing. This particular event has quite the balance of helping one cultivate their self awareness to better serve the greater tribe. I truly believe that you cannot have one without the other. Among many other skill classes I attended, I had the pleasure to learn and assist John Olsen in his Primitive Pottery class! John not only has been practicing the art of Anasazi pottery for over 40 years, but has taught many workshops all throughout the Western US in National and State Parks, and private gatherings to help share his knowledge of this work. He currently works for the Bureau of Land Management (BLM) tracking local clay deposits through Southern Utah and Northern Arizona to match pottery shards for archaeological records. His goal is to recreate functional pottery that use the same techniques and evokes the same spirit of the Anasazi people. For our class, John brought grey clay he harvested in the Four Corners area close to where he lives. We ground up Olivene via a lava rock mortal and pestle for temper and wedged it into the clay to start molding our pieces. Olivene is a mineral containing small amounts of iron, magnesium, silica, and helped our pots withstand thermal shock in the pit firing. We used the meditative technique of coil building while John demonstrated his corrugated pottery style. 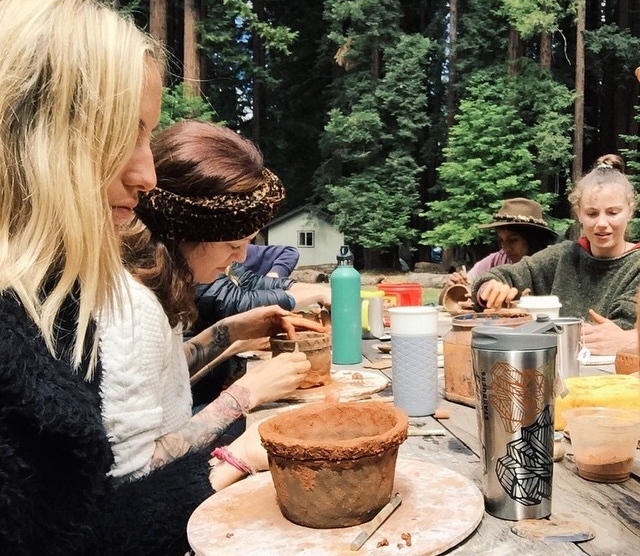 Despite two-three rain storms throughout our time in the Sequoias, our pots were able to dry enough to begin the firing process. 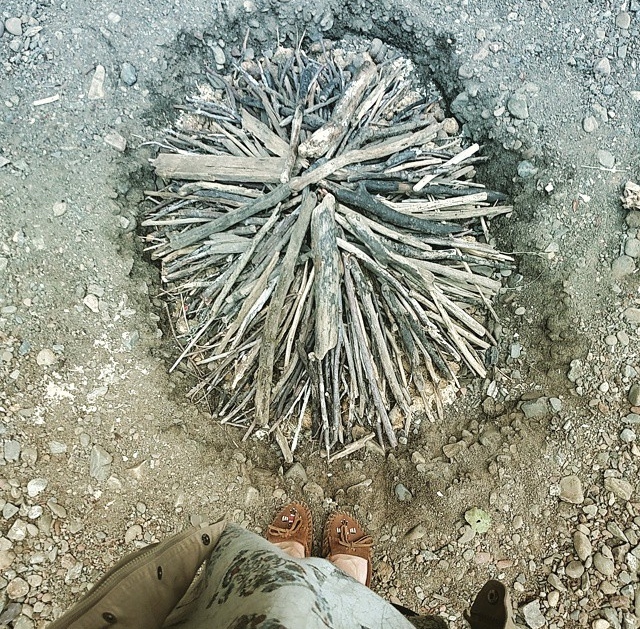 I did my best to forage for dry sticks and fallen branches for our fuel, and small granite rocks to act as kiln shelves in the pit. We were confined to using the preexisting community fire pit, but through this challenge I was able to see how firings can be done no matter the limitation! Over a span of 4-6 hours John and I were able to successfully fire 9 pots using what we had available and really staying present with the flames. The temperature reached was probably around 1600-1700 degrees Fahrenheit and the pots receive beautiful markings of carbon from the fire. Thank you John for this amazing learning experience and for memories I hold dear to my heart. Spirit Weavers is a five day celebration and embrace of the feminine heart. This all women skillshare event honors cultures past which represented basic human skills to ensure the survival of the body and the soul. 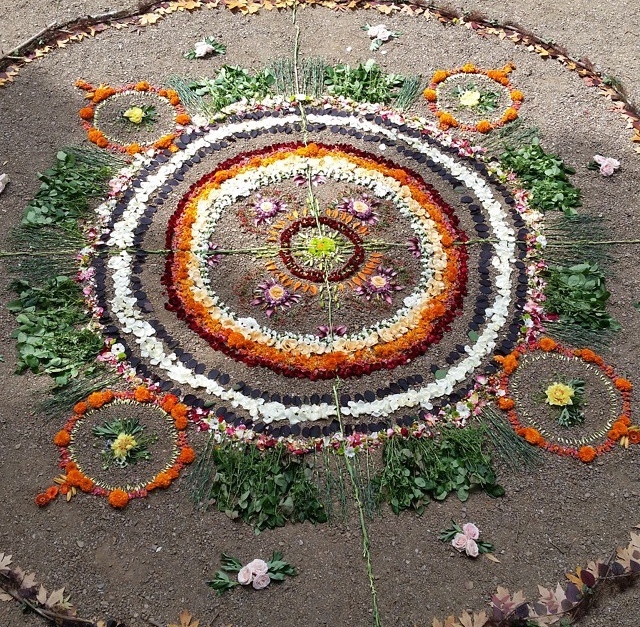 Offerings include fermenting foods, weaving, felting, dying fabrics, basketry, leather and cattail crafts, pottery, sharing tea, making plant medicines, song, yoga, dance, and creating ritual. This was the second year I offered my Primitive Pottery and Pit Firing class, however this was the first year I was on my own. 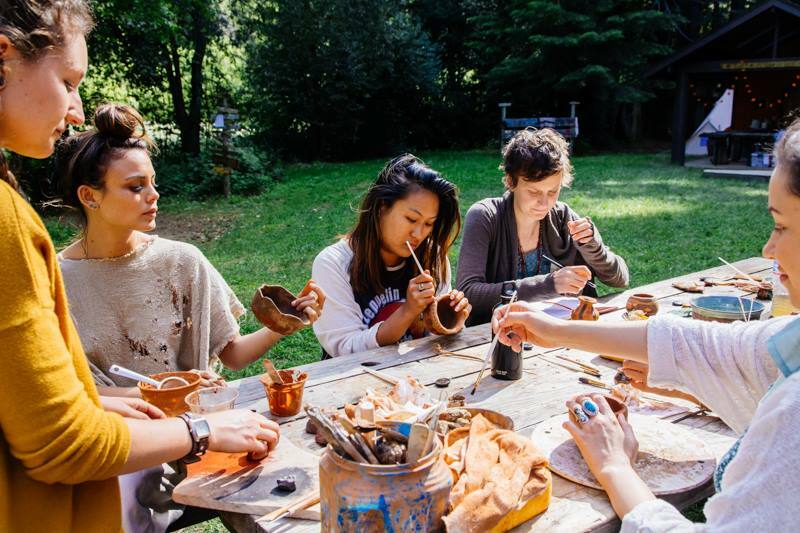 In 2014, my boss and friend Amara Alban co-taught with me as the gathering was located just down the road from MazAmar pottery studio here in Pioneertown. I enjoyed the challenge of harvesting local clay this time and teaching alone to fully surrender into my role of giving. I wanted this year's class to be more authentic to primitive pottery techniques with a focus on local materials. If we look to nature, we have everything we need. Prior to attending the gathering, I reached out to local ceramic artists at Mendocino Art Center to inquire about clay deposits in the area. I was reassured that I would find clay almost everywhere, as the soil is rich in it up north as opposed to the sandy/silty earth here in the desert. This is what I love most about being an artist-sharing resources and information! So I gathered all of my experience, my pointed shovels, and buckets and headed for the coastal redwoods of California to Camp Navarro! 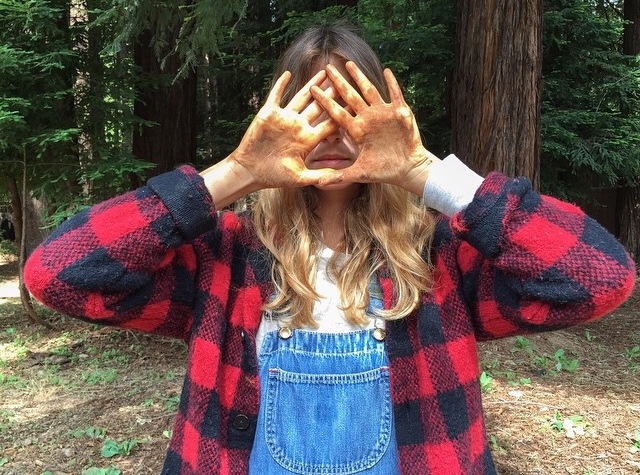 My first full day in the Mendocino area yielded no signs of direct clay deposits, but I was determined to find anything! The next day I drove down a few dirt roads and visited the local hardware store for more supplies and sieves. On my way to Ukiah from Boonville (the town closest to Camp Navarro), my head was turning left and right at the road cuts-clay!!! I soon pulled over to take a photo of a beautiful rainbow in the sky when I found my deposit, a beautiful rich red clay! I gathered about 10 gallons and left an earth offering for the land. That evening I started processing the clay by drying it out fully overnight and then stomping it into a powder the next morning. I added water to the buckets of now powder and let all the natural material level out by weight. The water rose to the top, then the leaves and sticks, clay, and heavy gravel. I poured out the water on the top and sieved the liquid clay slip into clean buckets. I gifted back all the water and debris to the earth and poured slabs of the liquid clay onto large pieces of canvas to dry. After flipping the slabs several times to assure even drying, I cut the slabs up into smaller chunks and started wedging the clay into a workable consistency. After I made about 20-30 1lb. balls, I added temper. This is one of the most crucial points of primitive pottery! Temper can either make or break your piece, literally. Temper is essentially small pieces of silica (grog), that when added to clay acts as small tiny cracks to help the pot during the thermal shock of the firing. It helps your piece shrink and expand with the fast heating and cooling of an open pit fire. Temper can be found almost anywhere and can be made from ground up quartz granite to chunky sand. The Navarro River runs through Camp Navarro, so I was lucky enough to find river sand in the perfect size temper I needed. I added a small handful at a time and wedged the sand into the clay to fully integrate. I let the 1lb. balls sit overnight and we used them the next day. Ideally this process takes about a week or two, but for the purpose of the class I'm glad I was able to make it work in three days or so. I gathered enough clay, so that next year I can arrive with the local clay pre-mixed, tempered, aged, and ready to go. 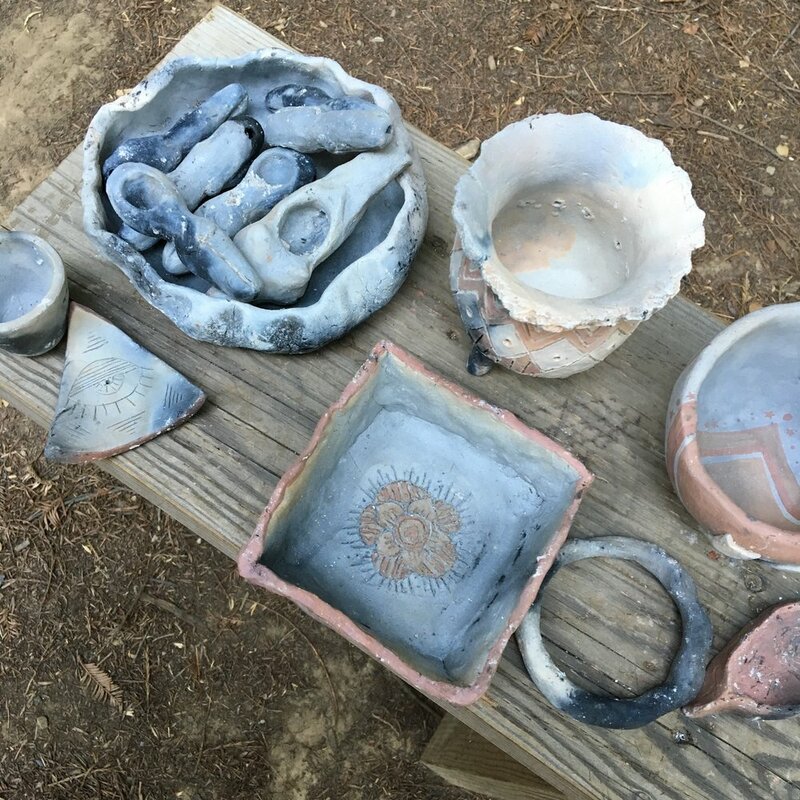 For my class, I discussed the history of primitive pottery, how to harvest and process local clay, and various techniques on forming a pot. We focused on the basic beginner's ceramic technique of pinch-pots. Each student made her own pot and the second day we decorated the pieces with different clay slips made from ground up oxides and ochres. We ground up chunks of Manganese and Red Iron Oxide and mixed the powders into the local clay slip to apply to the pots. All above images are copyright by Spirit Weavers Gathering: Renata Chebel and Kacie Tomita. All above photos are courtesy of my personal collection and from other students. It was a challenge working in a new wetter climate that I am not used to, so the pots took a bit longer to dry than expected. I ended up using one of the kitchen ovens to preheat the pots to 400 to remove all of the remaining moisture. 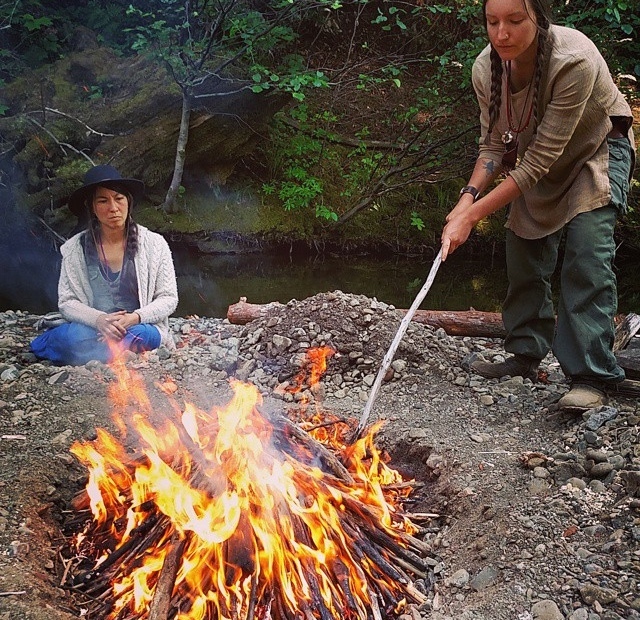 On the third day of the gathering, we set up our pit firing on the shore of the Navarro River. 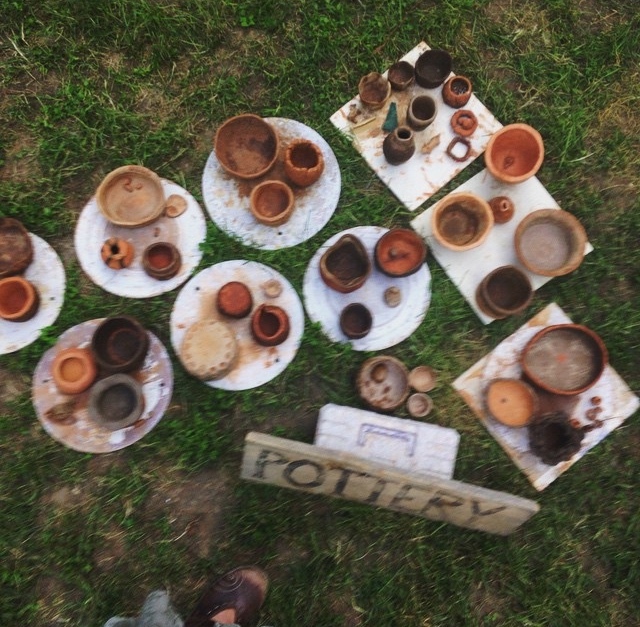 The ground was moist and so were the pots, so the firing was not ideal. Through the elemental steaming process of fire and water, the pieces ended up melting back into the ground instead of becoming permanent. To me, the fire became more of a releasing ceremony rather than impermanent becoming impermanent. The pots are now imbued into the shores of the river, which when the water rises, filters out into the Pacific ocean. The earth returned back into the arms of the Mother. Of course I was disappointed at first despite all of my hard work and heart put into the clay, but it is humbling to have failures and I still consider myself just as much a student as I am a teacher. I will definitely take what I have learned from this firing and apply this new knowledge next year and try again! All above photos are courtesy of my personal collection and from student, Lauren Kruz. I told my students that there is never a 100% guarantee in pottery and that their piece might not survive-but that is the beauty of it all. Nothing will ever last in this world. Sometimes I get tired of making fragile art but it's moments like these where I take something more than physical away. The learning experience for both myself and my students is invaluable and will keep me teaching for many more years to come. I am so grateful to all the women who took my class and opened their hearts to the transformative world of pottery, despite a different outcome than I had hoped. We are not only forming clay, but forming ourselves. For more information on next year's gathering and dates visit www.spiritweaversgathering.com.